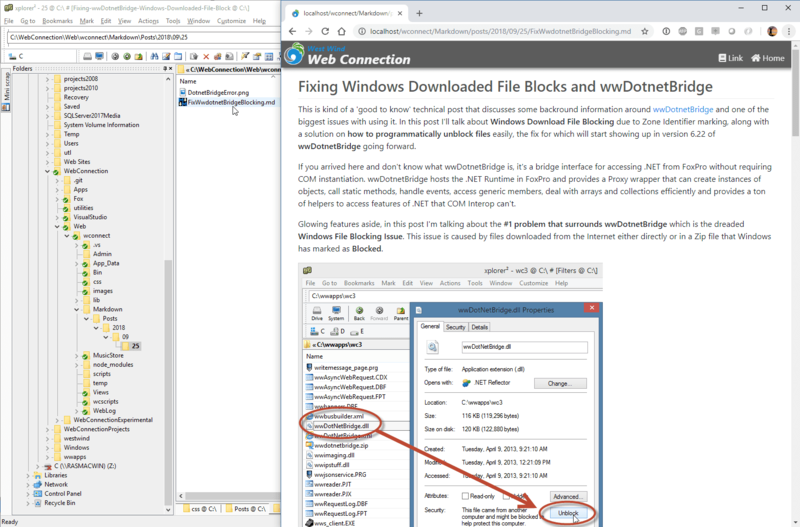 Web Connection includes support for adding raw Markdown files with .md extension, into your Web application's folder structure and have those files served as HTML merged into a well-known template. and have it rendered as a standalone HTML page. For this particular Markdown document I simply picked a Markdown file from an old Weblog post, along with an associated image and dropped that into a folder. And voila - we have a valid Web page from the Markdown just like that. To get this to work you need Web Connection 6.25 or later. The page should be served as HTML from the Markdown using the stock template. pcTitle - the title of the page which is extracted from the document. Either a YAML header if there is one, or the first # tag in the document. Otherwise the file name is used for the title. pcMarkdown - this is the rendered HTML from the markdown document.